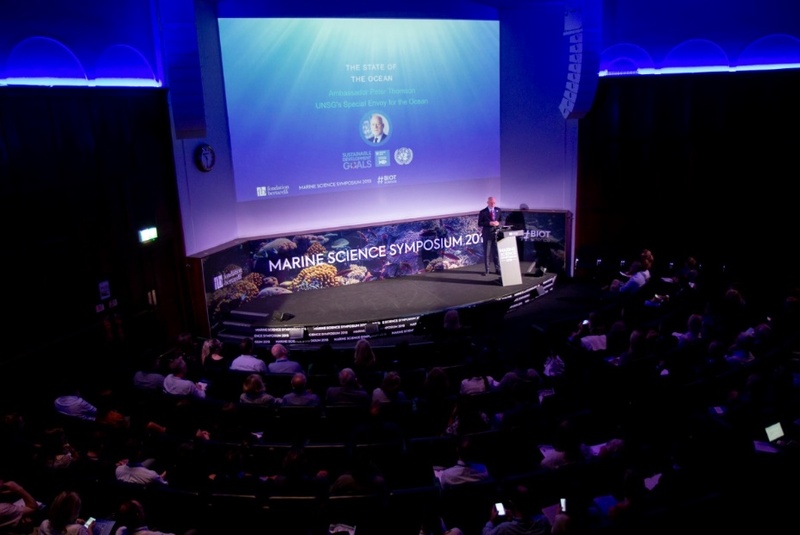 On Tuesday 11th September 2018 the inaugural marine science symposium for the Bertarelli Programme in Marine Science (BPMS) took place at the Royal Geographical Society in London. This one-day symposium brought together scientists, students, conservationists, policymakers and Marine Protected Area (MPA) managers to listen to presentations highlighting key research being undertaken in the British Indian Ocean Territory (BIOT). This impressive line-up of speakers included keynote presentations from Amb. Peter Thompson, the UN secretary General’s Special Envoy for the Ocean, the New York Times’ journalist, Ian Urbina, recounting stories on ‘outlaw ocean’, and a special video message from HRH the Prince of Wales. The open ocean session introduced the work being done using different technology to track and investigate how sharks and other pelagic species use the MPA, the networks identified and how oceanography can help us to understand how wave dynamics create predator hotspots within BIOT. The reefs and islands session covered the status of coral reefs and investigations to better understand their role in the archipelago and across the Indian Ocean and the use of bio-logging technology to investigate how species such as turtles and birds use the MPA. Nick Graham, Lancaster University and Principal Investigator of the reef fish project, explained their recent work identifying the link between rat infested islands, the presence of birds and the impact this has on the health and biodiversity on the nearby reefs. The final session linked the science to management, highlighting the important role science plays in informing management and the use of large MPAs as a conservation tool. After the close of the symposium, guests joined a reception to celebrate marine science and to digest all the information communicated throughout the day. With 2018 as the International Year of the Reef, thoughts are driven to how we can best protect our oceans, what is being done to protect them and how we can raise the profile to ensure we work collaboratively across the world to tackle these pressing questions. All presentations from the events are now available to watch on our YouTube channel here.